In 1990, I had to go to Yuma, Arizona on business. Yuma is more-or-less equidistant from Phoenix and San Diego. Since I had never been to San Diego, I called a friend and asked if he could handle a weekend guest. He said sure. At that time, Tim and his wife lived in a lovely old (circa 1915) house in San Diego. The house had a large three-car garage and a three-car carport behind it. 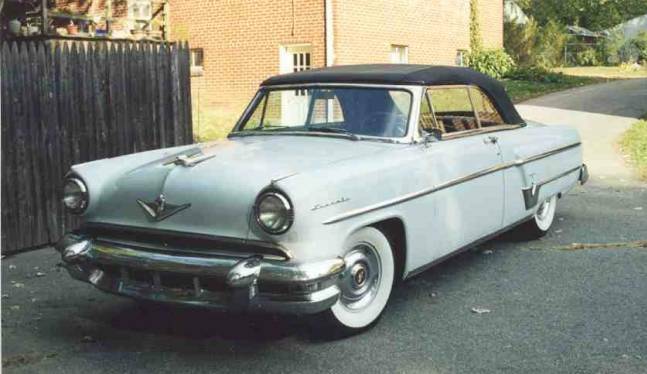 Tim had his '56 Premiere sedan, two '54 Capri sedans, a '61 sedan (or was it two? ), a '65 sedan, and a Mazda pickup. I spent some time looking at the two '54 Capris, and thought to myself, "Egad, these cars are simple". Thus began my search for a Road-Race Era convertible. It took me almost five years to find the car I wanted. The ad was placed by an old car dealer in suburban Chicago. When I went to look at the car at Christmas (1994), I found a really nice driver with 110,000 miles. The car ran well, had an undercarriage that had not been touched, and excellent brakes. It had good but not perfect paint, good but not perfect chrome, good but not perfect top and interior, good but not perfect..., well you get the picture. I had informed the dealer that I would be able to pick up the car sometime in March, and it took a month to finalize the purchase. While I waited for February to slowly crawl by, I spent a lot of time thinking about how to move the car from Chicago to the East Coast. I considered driving to Chicago with my station wagon and towing the car home. I received a quote to have the car shipped for $650.00. I found a club member who owned an enclosed transporter and was willing to give up a weekend at the end of March. Upon careful deliberation, hearing a favorable long-range weather forecast, and finding two inexpensive airfares, I decided to drive the car back. The trip was put together at the last minute. I called John Sweet and asked if he wanted to do a road trip. I called the dealer, and inquired if they could do a few things to get the car road-ready. I visited a local auto parts store for some spare sparts (Murphy insurance, actually). I put together a portable tool kit. I called the airline and booked two seats. I also thought about calling a psychiatrist. On March 9th, First Chief Assistant Co-pilot John Sweet and I met at Union Station in downtown Washington, DC, and boarded a train for BWI Airport in Baltimore. Of course, the trip got off to an auspicious start, as the flight left BWI two hours late. While waiting to board the plane, we were talking with some of the other passengers likewise stuck. When we mentioned why we were taking the trip, some people said we were brave, some said we were fools, a few said we were brave fools, and others thought we were touched in the head. By the time we got to Chicago, found something to eat (the airline served peanuts), and got to bed, I was beginning to wonder about that myself. With anticipation and adrenaline working closely together, we got a few (very few) hours sleep, and picked up the car late the next morning. After stopping at an auto parts store for some supplies (more Murphy insurance), and at a local deli for some munchies, we hit the road heading east at about 3:15 PM. Our route took us through downtown Chicago, heading for the Indiana Toll Road. Of course we drove straight into the teeth of a Friday afternoon rush hour. After spending the better part of an hour crawling down the Chicagoland expressways, we finally made it to the Chicago Skyway, and clear roads. We then discovered that the front end tended to get somewhat lively when our speed exceeded 55 mph. So we continued east at the meteoric velocity of about 52 mph. We didn’t get there fast, but we did get there. During the evening hours, we amused ourselves with conversation about old cars, the AM radio and chatter on the CB radio. We heard several comments like: “Did you see that old gray car heading east?” Others attempted to identify the car as a Mercury. Correct identification or not, all of the voices were admiring in nature. The drive across Indiana and Ohio went smoothly, until we stopped for fuel outside of Cleveland. That was when we abruptly learned that with a six-volt electrical system; you cannot use the lights, the AM radio, and the CB radio all at the same time, (and for several hours) and still expect the car to start. After the sun went down, the temperature dropped down to the high twenties. With only the front heater (defroster, mostly) functioning, the feet of the person driving the car (me) tended to get a tad cold. First Chief Assistant Co-pilot Sweet also remarked that all of the lights were really bright. The planned overnight stop was at the home of noted raconteur, winemaker and Lincoln collector Tom Lerch. Since we had left Chicago late, and were limited in our speed, the trip to Ohio took somewhat longer than anticipated. I had predicted we would get to the Lerch residence by 10 or 11 PM. We actually arrived at 1 AM. The next day, we met my brother for lunch outside of Akron. The trip then continued east, without incident, until we stopped for gas in Breezewood, PA. After filling the tank, we noticed fuel dripping from the back end of the car. Getting underneath, we found a leaky fuel line running from the side of the gas tank to the left quarter panel. We borrowed a floor jack, and spent an hour replacing the fuel hose. The final dash into Washington was trouble-free. By the time we finally arrived home, we were so psyched and tired that we completely forgot about dinner. I was absolutely thrilled with the way the car ran during the trip from Chicago to Maryland. 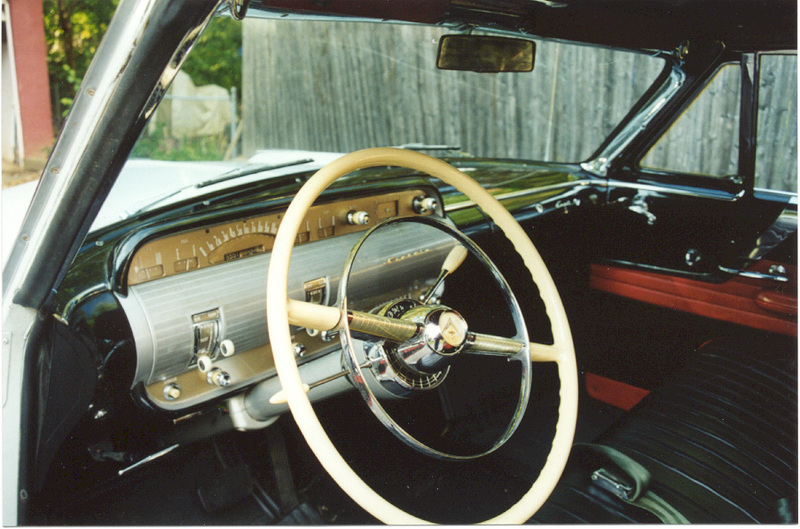 During the drive, First Chief Assistant Co-pilot John Sweet remarked several times how well the car handled, even allowing for the bias-ply tires. We both noticed that is there is no “50’s big-car wallow”, and the car readily goes where you point it. The engine also showed willingness to run far faster that the front-end was ever going to permit. The warm weather is returning. There are car shows to attend, and the top will be down. This article was written during the summer of 1995. I did take the car to the big joint Lincoln Meet in Dearborn, and the car performed wonderfully. I had an interesting experience purchasing tires for the Capri. The first set acquired were the wrong size, and I discovered that the inner sidewalls of the front tires rubbed against the upper ball joints and the tie rod ends. I also learned that the new tires were only slightly less out-of-round than the old ones, as my highway speed increased to about 62 mph. These tires were replaced with correct ones. When I was having the second set of tires installed, I almost had a fire in the car. I began to smell smoke, and decided to look for the source. I found it under the back seat. The power feed wire for the convertible top electrics had shorted to ground, and I found that the top motor and relay were too hot to touch. After disconnecting the feed, I spent some time looking for source of the problem, but couldn't find it. In checking the rest of the wiring, I learned that the car had its original wiring, most of which was in less than perfect condition. I then decided that the car needed to have all of the wiring replaced. The wiring project stretched through the winter and into the spring of 1996. I got the car running again two weeks prior to the CCCA Lincoln Experience in Michigan. Off we went on our second big trip, first to Michigan, and then on to Chicago for a few days. As before, the car ran great. It was during the fall of '96 that I learned about a Model K Lincoln for sale in the Chicago area. We will talk about this car a bit later. At that point, the budget said "Only ONE Toy", so I began to give some thought to selling the Capri. A fellow club member in the area bought the car in late 1997. He still has the car and brings it out regularly. When he does, the car tugs at my heartstrings, and I sometimes wish that I hadn't sold it.